The goal of the Fellowship Breakfast Forum is to socialize while sharing ideas that draw on the wisdom of each other during these uncertain times. Our hope is To: Organize the men of the Men’s Fellowship Breakfast Forum for the purpose of Christian fellowship and social action. 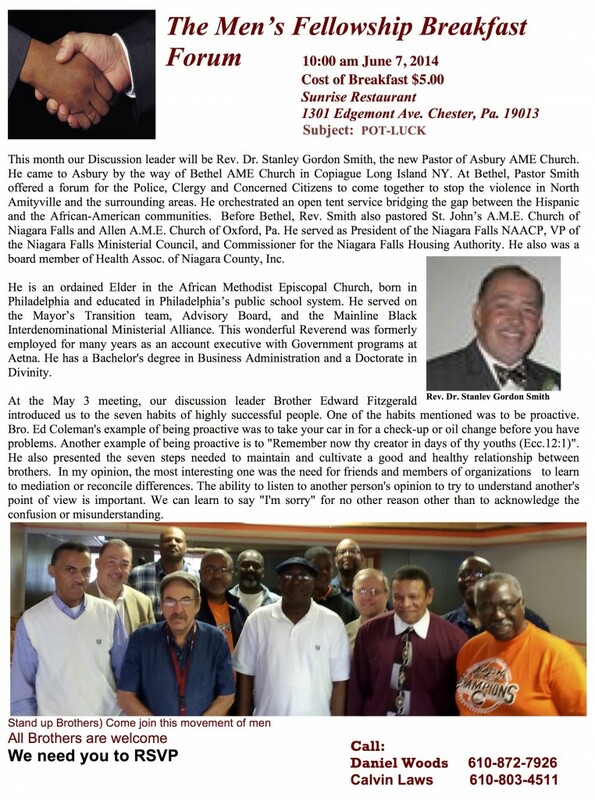 To: Enlist and develop men as leaders and role models for the youth of the city of Chester. To: Encourage men to engage in community and state affairs. To: Encourage inter-church connectional activities among men. and a B.S Degree in Political Science, from Fayetteville State University, Fayetteville, NC. 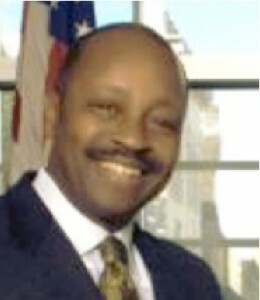 He is a member of the Delaware County National Bar Association as well as the Pennsylvania Trial Lawyer Association. 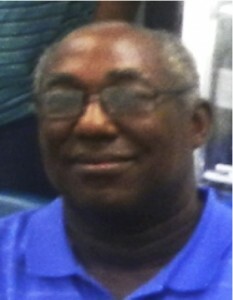 He is also a Board Member of the Chester Fine Arts Center and a member of the NAACP. Al has over twenty (20) years experience in the practice of criminal law. 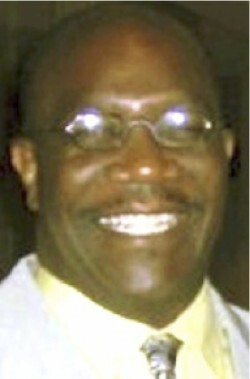 Mr. Jacobs worked as an Assistant Public Defender in the Delaware County Public Defender’s Office. Prior to that position, he was in private practice for several years. We often talk about our elected officials at our Men’s Fellowship Breakfast. Now, we have a chance to have a direct open dialogue with one. Don’t miss out on the opportunity to share your opinions with someone who sits at the table making decisions for our city. Please remember to bring your Donate to the Boys and Girls Club to help pay the annual membership fee for boys and Girls That can’t afford to pay the membership fee. 2600 West 9th Street, Chester, Pa. 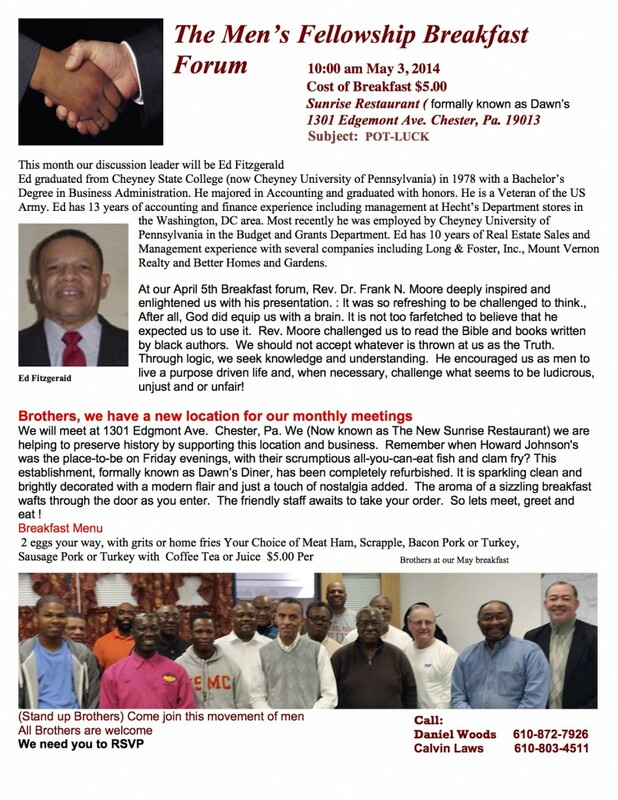 The Men’s Fellowship Breakfast Forum 10:00 AM December 7th 2013 Cost of Breakfast $8.00 At Sweet Lucy In Community Hospital 2600 West 9th Street, Chester, Pa. Subject: Pot Luck This month our discussion leader will be Dennis Jackson of Dennis M Jackson Sr. Insurance Agency Inc. Dennis study taxation for Individuals and Estate Planning at Philadelphia University, Philadelphia Pa. He Provide Financial Services, Property and Casualty Insurance, Life Insurance, Health Insurance, Auto Loans, and IRA’s, Roll overs. He is a tenacious, ambitious, caring, compassionate individual who desire is to promote Financial Literacy in the Delaware Valley and beyond. Help families to protect their valuable. At our November 2, 2013 breakfast forum, our Discussion leader. Jeffery Legette gives us a history of the Boys and girls club and expresses his deep love for what they do. The Boys & Girls Club of Chester has been a consistent source of opportunity, encouragement, and enjoyment for the children of Chester. One of the main focus points of The Boys & Girls Club of Chester is to supplement the formal school training with tutoring and mentoring. The Boys & Girls Club of Chester have a limited staff of trained and dedicated professionals with many years of service in the Chester Upland School District. The club operates on a relatively small budget while trying to fulfill the needs of Chester’s youth. The Club is designed to be available for any child who wants to take advantage of what the Club has to offer at the cost of $30.00 annual fee. The Club serves boys and girls ranging from 6-18 years of age. The largest age group that it serves is in the age range of 10-14 years with 50% of the summer population are girls and we generally accommodate approximately 90 to 100 faces daily. We were inform that although the club serve a large number of children in the city of Chester most of them can not afford to pay the yearly dues of $30.00 Donna Northern give us a picture of how important financing is the present availability, and the future survival of The Boys & Girls Club of Chester is the development of a stable, reliable, and consistent funding stream for the present and budgeted expenses of the Club. We are constantly trying to be able to tap into the generosity of many major organizations and institutions. We hope to be able to capture and maintain the confidence of all those organizations who have recently helped or, who in the future, may want to help The Boys & Girls Club of Chester with outstanding caring and action. The ability of the Club is to generate a consistent, reliable funding stream for both operational expenses and capital projects that will determine just how well the Club will be able to fulfill its desired mission. In the Spirit of ever one save one The Men’s Fellowship Breakfast Forum is requesting that every man and woman demonstrate there love for our city and as an act of kindness to the children of Chester Donate a Christmas gift $30.00 the cost of one child annual membership to the Boys and Girls Club. This is our city and these are our Children. Make check payable to the Boys and Girls Club of Chester and send to The Boys & Girls Club of Chester Att/ Donna Northern P.O. Box 1077 Chester, PA 19016. 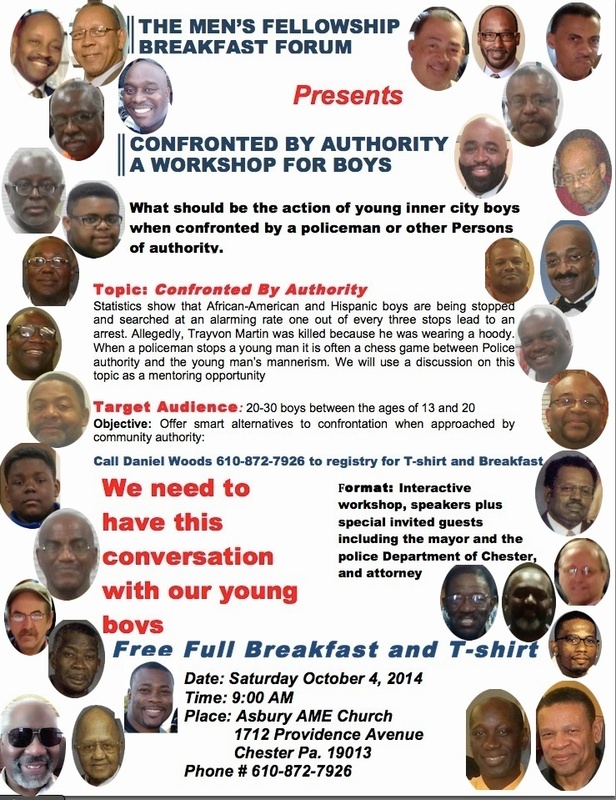 At our Breakfast All Brothers are Welcome We Need You to RSVP so we will have an Abundant of Food.